Since 2003, West Africa and the European Union (EU) have been negotiating an Economic Partnership Agreement (EPA), as is the case in many other African and Pacific regions. The EU has stated on numerous occasions that beyond market access, EPAs are to present an opportunity to strengthen regional integration and put ‘trade at the service of development’. It is in this context that the EPA Development Programme (EPADP), better know under its French acronym PAPED, was developed by the region. It constitutes a framework to identify evolving development support needs in order for the region to reap the benefits of the EPA and to mitigate the negative impact of the agreement. 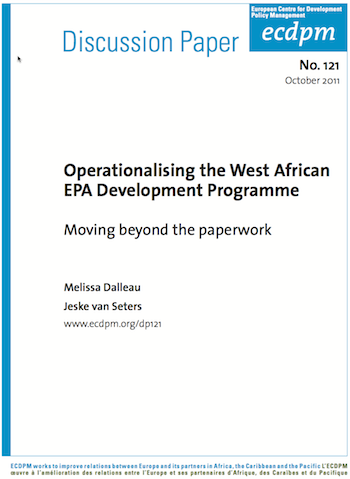 If the EPA were to be signed, the EPADP could be operationalised to deliver on its potential. It is recognized by both parties that beyond resource mobilisation, the EPADP could be instrumental in improving aid effectiveness by contributing to a more coherent and coordinated approach to addressing the trade-related needs of the region. Against this background, this study aims to provide insights in the operationalisation of the EPADP and its potential to contribute to more effective aid, particularly at the regional level.